ALBANY, NY: Just when you thought it was safe to go to the mall, Pyramid Crossgates proposes yet another project to destroy Pine Bush and potential Karner Blue habitat. Albany City Hall was the setting for Pyramid to describe to the Albany Common Council Zoning Committee how its proposal to build a residence inn hotel on 3.72 acres adjacent to the one of the largest sites of Karner Blues will have no environmental impact. In 1998, Pyramid Crossgates illegally bulldozed this parcel and spread gravel on it for a parking lot (see Times Union, 10/21/98, page B3). Now, in their environmental assessment form, Crossgates asserts that the parcel is virtually flat (because they bulldozed it), that the site does not contain any species of plant or animal life that is identified as threatened or endangered (because they bulldozed it), that the site contains no sand dunes (because they bulldozed it), and that the site contains no mature forests (because they bulldozed it). Crossgates is saying that there will be no significant environmental impact of this proposed development and that the Albany Common Council should not require an Environmental Impact Statement (EIS) to be prepared. This site, located on Washington Avenue Extension just east of the Time Warner Building, is contiguous with the Karner Blue Butterfly Hill. Ironically, this tiny hill, surrounded on three sides by Crossgates Maul, is one of the largest remaining sites of Karner Blues in the Pine Bush. Pyramid Crossgates was forced to preserve this site of Karner Blues when it was given permission to build the maul. In the fall of 1997, Pyramid expanded the maul and built theaters. Save the Pine Bush and the Karner Blue Butterfly sued over this expansion, arguing that the tall theater building would cast a huge shadow on the Karner Blue Butterfly Hill, shading out the butterflies. Studies had shown that increased shading would result in increased mortality of the butterflies. Shading lowers the temperature of the larvae, causing the larvae to grow slower. Unnaturally extended development periods are well known to increase mortality in larval butterflies. These pressures of temperature are so intense that they are thought to be the primary evolutionary drivers in the host plant selection and habitat use in many species of butterflies. SPB’s butterfly expert stated that the butterflies depend on direct sunlight to control their metabolic rates and the ability to digest food. Because the butterflies need sun, SPB believed that the shadows would interfere with the ability of the Karner Blue to live and reproduce. SPB lost the case, and the theaters were built. This chart, prepared by the Albany Pine Bush Preserve Commission and distributed to the Zoning Committee on Novemember 20, 2003, shows the census of Karner Blue Butterflies at the Crossgates Karner Blue Butterfly Hill. 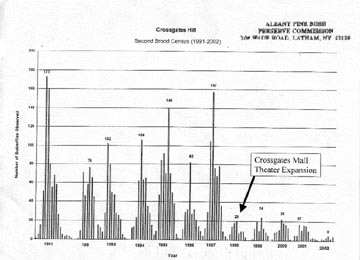 Note when the Crossgates Theater Expansion occurred. Sometimes, SPB hates to be right. Our worst fears about what could happen to the butterfly, did happen. At the Zoning Committee meeting, Neil Gifford handed out a chart of the second brood census of the Karner Blue Butterfly Hill site from 1991 to 2002. It is clear to see a dramatic decline in the numbers of Karner Blues after the theater construction. Mr. Gifford was careful to point out that cause and effect is difficult to prove scientifically, that Karner Blue Butterfly populations naturally fluctuate, etc. etc. However, take a look at the chart. Its not like there is a lot of time to do experimentation on this issue. Clearly, constructing large buildings near critical Karner Blue habitat does not help the butterflies, and a reasonable person would conclude that such construction probably hurts the butterflies. Before Crossgates illegally cleared this lot where they now want to build this residence inn, no studies of plant, animal, and insect species were done. Because this site is so close to the Karner Blue Butterfly Hill, it is quite possible that blue lupine, the feed plant for the Karner Blue, was growing on the site or that even Karner Blues could have been found on the site. This site appears to currently be unused, as Crossgates closed it off after the neighbors called attention to its illegal construction. Grasses can be seen, sprouting through the gravel. It is possible that even now, lupine or Karner Blue nectar plants grow on the site. Of course, its hard to tell with winter around the corner. Only by studying the site in the spring time can a determination be made of what species of plants, animals, and insects remain on the site. This development proposal flies in the face of the Karner Blue Butterfly Recovery Plan. At some point, the City of Albany needs to say “NO” to sprawl, and “YES” to improving the quality of life in Albany. Protecting the Karner Blue Butterfly protects one of Albany‘s rarest assets. Promoting downtown, means banning sprawl. Please call or write your Common Council member and the chair of the Zoning Committee and tell them you want to see the Karner Blue protected. If you do not live in Albany, write to the chair of the Zoning Committee, Hon. Daniel F. Herring, 4 Fairlawn Avenue, Albany, NY 12203, phone 438-7527 and tell him why the Karner Blue must be protected. A list of the Common Council Members can be found at http://www.albanyny.org/government/officials/index.asp.